Rejoice, dear heart, finally some Muslim has written to me. Even though it is from a land far off. And even though it is only to blast me for inviting non-Muslims to chant God’s name for a few minutes on the World Day of God for which I issued a call to coincide with the most blessed day of Hajj. Evidently, the gentleman was concerned that in promoting the concept of God’s Name Chanting on a worldwide basis for 15-20 minutes, which he referred to as Dhikr, I was corrupting the pristine teachings of the Qur’an on the one hand and the impressionable minds of his children – Muslim youth – on the other hand. And he said that it all sounded like some exotic Sufi mumbo-jumbo. Not his, but my words these: “mumbo-jumbo.” Also “exotic” – he did not say that either. Often, I do not respond to these negative reactions from people. I generally have a fairly good feel for them. I know how some of them are “canned” and “prefab” while some of them are palpably hate-filled. But I felt this particular letter called for a response. Not the least for raising the question of corrupting the minds of Muslim children from presumably good Muslim homes. So, here is the substance of what I wrote in response, elaborated and touched up a bit for this post. But first, I give below what the gentleman had to say about my asking mostly non-Muslims around the world such as Christians, Jews and Hindus to chant God’s name for 15-20 minutes on World Day of God. So far as the Muslims are concerned, they have been drilled in how to think and talk about and to Allah all their lives. At least they ought to be, if they have anything to do with the Qur’an. That is right: “Talk To” Allah too. By and large, Muslims should also routinely know all the various forms Dhikr of Allah should take. The point is, everyone must think and talk about God Almighty all the time. How they do it is also a question for which they should all have their answers at their fingertips. Islam teaches that there is formal and informal Dhikr. And there are all other kinds of Dhikr in Islam. There is Salaah (prayers so-called). And there is everything else. In any case, Muslims should know that Islam is Dhikr, period. From beginning to end. And it is more or less a 24-hour, seven-days-a-week job: doing the Dhikr (chanting the name) of your master and creator. According to Hadith, Ratbam bidhikrillah (dripping with Allah’s remembrance) is how your tongue is supposed to be with the chanting of the names and attributes of Allah: bidhikrillah. So, what we asked people of the world to do on this past World Day of God for 15-20 minutes on Hajj day is as rooted in the Qur’an as anything you can possibly imagine. But, naturally, all too many Muslims never received that memo: Read the Qur’an. So, they never bothered to open the Qur’an, unless of course, in many cases at least, when their grandmother died. Even there they always have the option of paying someone to read the Qur’an – for their dead. And should I say for themselves? “To: The Editor – Radiance views weekly. Subject: Your article in Radiance 31 Oct – 5 Nov 2010 issue at page # 28 under the caption “Do It for 15-20 Minutes” – by Syed Hussain (sic) Pasha. It is very surprising to read an article of this nature having no authenticity in the Holy Quran & Sunnah. Such forms of ‘zikr’ we used to hear from the wrong tracked so called ‘sufis’ and how come a reputed magazine like Radiance has trapped into with such type of unislamic views. We read Radiance & subscribe to our children to learn Islam and Islamic view points on current issues. Please avoid such articles in future. Sd: Name of Writer of Letter. I have been writing for Radiance for more than five years fairly regularly. I am thrilled that someone finally noticed and then found the time to respond to something I wrote. Allah bless you and all those who read and pay attention to what I write and take the time and trouble to respond to me in some way! As for the substance of your comments, allow me to point out that I endeavor to ground practically every word I say in the Qur’an. I am grateful to Allah for guiding me to the Qur’an. I am tempted to say here something that Iqbal once said about his writings – his poetry that is. But I will not say it. Iqbal being the 20th Century poet from the Indian Subcontinent who wrote in Urdu and Farsi languages and who is hands down one of a handful of the greatest poets in the world in any language or culture. It is to the eternal shame of Muslims – and the world – that the Muslims and the world know so little about Iqbal and about the majesty, beauty and reach of his poetry. So, if you are curious, and you should be, you can check out what Iqbal said about his own poetry. That is what Iqbal said about his writings. And I will not complete here the rest of his thought in that context. That is the standard I try to hold my writings up to, no matter how little I may succeed in actually meeting that Gold Standard that Iqbal, Allah bless him, had set for his own writing. And how well Iqbal succeeded in meeting that goal! Allah bless him. And how Muslims, even many of the better ones, turned their back on him! Just what is wrong with inviting everyone on God’s earth, Muslim and non- Muslim, to chant the name of God? According to the Qur’an, everything in the universe does chant his name anyway! If you know your Qur’an that is. In the article you referenced, I am calling Hindus, Jews, Christians and everyone else to devote 15-20 minutes once a year to think about God and chant his name. Which part of the teachings of Qur’an does this violate? As for Muslims, they know what to do and how to do it. So, why is this bad for you and your children? In fact, now that someone has taken the trouble to write about something I said, let me say this: If Muslims had paid serious attention to what I have been writing for all these five years or more, and saying for years and years before that, we would have taken some major steps toward changing the world. It was I think in 1988 that I articulated in a major and public way my vision for reviving and regenerating the Muslim Ummah – and the rest of the world. Not that I hadn’t been saying that before that, because I was. We can still do it, Inshallah, if Muslims will engage with what I am talking about and not play turkey with themselves and the rest of the world by burying their heads in the sands of time and in the face of the juggernaut of change that is swamping them from all sides. Of late, however, I have interrupted the flow of my writing to Radiance for the most part for lack of response from readers – or anyone else. In the meantime, I am open to hear anyone’s views, and share my views with them, if they are really serious. So feel free to write to me on this or any other subject. Take some time, spend some energy and think and understand about what is being said. And then engage in a meaningful way in discussing it. (b) Listen to Pasha Hour International archives – over and over if necessary. If nothing else, it is fairly good English language exposure – both written and spoken – for our Muslim children and other children and adults. Again, while you are doing it, please feel free to discuss with me anything you want. 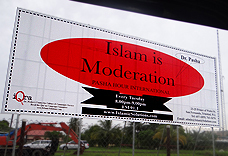 Also, listen live to Pasha Hour International — Live from America! every Tuesday morning 5:30 AM India time on the Internet. And call, and talk, and discuss. Allah bless, guide and help you – and all of us – for paying attention to some of what someone wrote and taking the time and trouble to addressing it. Meaning: Peace and blessings be on or with you. Next: You Must Read That Book!